1 stone. The stone should be 1.5 to 2” in diameter, give or take. 1 plastic bag. The bag should be the kind you find in the vegetable section of the grocery store — the clear or slightly frosted kind you pull from a roll. This exercise doesn’t really work with ordinary plastic bags, so you have to get this part right! 1. Fill the bag with air and tie a knot at the opening to keep the air in. 2. Put the stone on the bag. 3. Hold the bag in your hands with the stone balanced on it. 4. Just experience how this feels for a while. 5. Notice what comes to mind. 6. When you are ready, put the bag down and write. 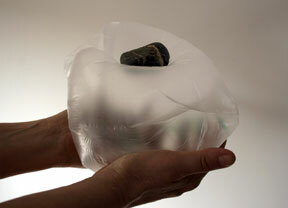 If you need prompting, think about the relationships between the stone, the bag, the air, and yourself. What happens when you move, even slightly? What sensations do you become aware of? What do you feel? What thoughts arise? Where do they go? How do sensations, feelings, perceptions and thoughts arise, influence one another and change? Where does this lead you? As I recall, some of the final writing pieces produced by my colleagues had only the faintest traces of the stone and the bag. But that didn’t matter. The point of the project was to heighten one’s awareness of the fluid, uncertain and interdependent relationship of matter and mind in its multiple aspects and to give voice to the experience that unfolds. What begins as a sensorial experience becomes contemplative and, finally, reflexive. Phenomenology bodes well in the arts where the emphasis is on the senses and the practice of working mindfully with materials in the world matters. The awe I experienced holding this simple construction in my hands seems miles away now. But that one moment, that one teaching and learning moment, continues to inform me. Latour critiques social constructivists for assuming that “society” is foundational and homogeneous. But Latour is also guilty of painting social constructivists with a broad stroke. There are different kinds of social constructivists, with different approaches and beliefs. While Latour critiques theory, saying it is quite different from practice, his approach is very theoretical. Again, does his model match up with how scholars actually think? While Latour’s model is schematic and reductionist, it does bring into focus a point of view that avoids the pitfalls of both realism and endless relativism and proposes a set of guarantees to ensure the gradual construction of the common world. This common world includes more than humans. How will these non-human actors speak and be heard? How will scholars take them into account? How will I factor them into my research? Can understanding the relationships between the human and non-human help us rethink or understand society in a better way? How does the idea of the ‘knowing subject’ which has been subjected to critique in critical sociology and post-colonial studies figure into some of these ideas?